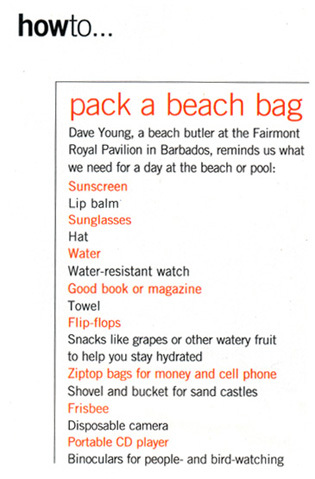 Guests ask, "What do I pack for a perfect cruise?" With 20 years experience in cruising, Coordinator Cynthia Neu McCluskey recommends bringing one suitcase, one carry-on, your valid passport, a valid credit card, a hat, sunglasses, sun screen and your smile. "Traveling light means you go quickly through security. And when you smile you're invited to all the parties. Follow these tips," she says, "and you will have a fun and easy time at sea." 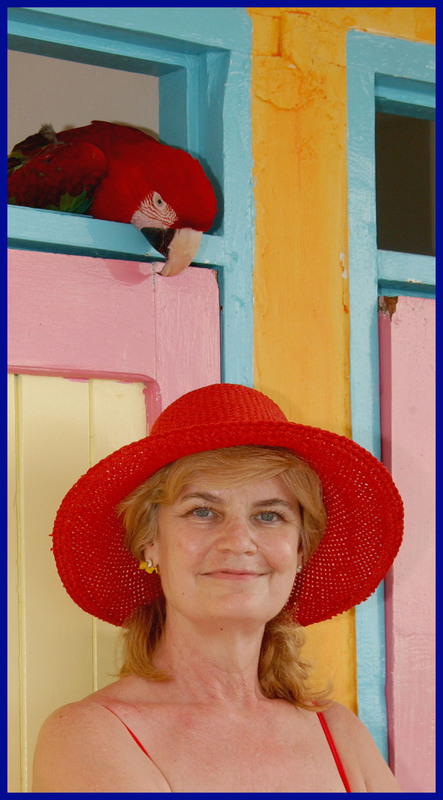 Cynthia's cruise information and tips are updated regularly, but can change at any time too. Always feel free to call with your last minute questions. "Thank you for this thorough and logical information. I've read every attachment and will continue to do so as my cruise approaches. I've traveled the world. This is probably the most extensive and logical information I've ever received in preparing to go. Thank you very, very much." Barbara Kelley, Houston, TX. 1.) Are all meals included? 2.) How do we pay for alcohol and sodas on board ship? 3.) How do we pay gratuities? May we use debit cards? 4.) How do we pay for our personal expenses on the ship? 5.) What do I wear? May I rent a tux on the ship? 6.) Is there medical staff on the ship? Why do you require insurance? 7.) What about passports and visas? Do we need them to cruise? 8.) How do we sign up for shore excursions? 9.) What should I pack to wear? How do I pack all my medicines? 10.) Is there long-term car parking at the piers? What time can we board? 11.) How do I buy air line tickets? How do I get from the airport to the ship? 12.) Is it wise to take my good jewelry on a cruise? 13.) Is there gambling on the ship? 14.) Will there be other things to do on the ship besides Fun & Fitness events? 15.) Why is it necessary to book a cruise so far in advance? 16.) Why can't I book your cruise on the Internet if it's cheaper? 17.) 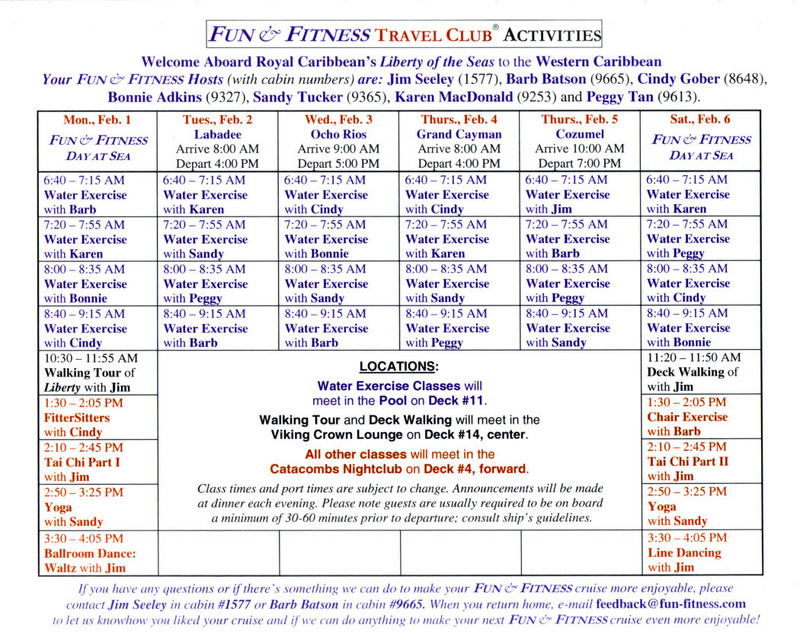 How do I know where to go for our group exercise classes on board ship? 18.) How can I be reached on the ship if there's an emergency at my home? 19.) How do I purchase a wine/water/soda package for my cruise? 20.) What if I leave my toiletries at home? 21.) Will my cell phone/lap top/iPad and iPhone work on the ship? 22.) Is there Internet access? 23.) Who do I call if I forget something on the ship, if my credit card was wrongly charged or if I have a complaint or compliment to give Royal Caribbean or Fun & Fitness? 24.) Is smoking allowed on board ship? 25.) What basic personal safety precautions should I take when cruising? 26.) What would be good questions to ask a potential cruise cabin mate? 27.) What is the Crown and Anchor Society at Royal Caribbean? How do I join it? 28.) The ship is handicap accessible, but what about shore excursions? 29.) When we are cruising and dock at different ports of call which time do we follow? Do we follow local time or the ship's time? What is the ship's time? How will we know it? 1.) Are all meals included? Each cruise includes all your meals and snacks on board ship. Whether you want to taste everything, or follow a special diet, you are welcome to it all when cruising. You can also order 24 hour Room Service with a 'convenience fee'of $8 per delivery to your stateroom. As long as everyone in the room orders at the same time the fee is $8. If roommates order at different times the charge will be $8 per delivery. There is no charge for the food. Only for its delivery. Continental Breakfast for your stateroom has no delivery charge if you order it between 6 and 11 AM. Ask your cabin steward for a Breakfast Menu. A Continental Breakfast consists primarily of fruit, pastries, toast, coffee, tea and juice. If you are a vegetarian, or want a gluten free diet, or if you are diabetic, indicate this when you book so your reservation can be marked accordingly. Also write on a notepaper for your head waiter your personal menu requests. Give it to him or her on the first night at dinner on your cruise. The kitchen staff can then plan a special diet for you. Every ship also has a selection of specialty restaurants which charge a nominal fee to dine there. All meals in the formal dining hall are included in your cruise fare. It is a highlight of cruising. Since our travel club follows a fitness theme we book everyone at the early dinner hour which is seated no later than 6:00 PM daily. 2.) What about alcohol and other beverages on board ship? Bottled water, hard liquor and beer consumed during a cruise must be purchased on the ship. 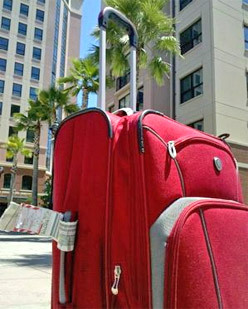 No one may board ship with distilled water bottles, liquor bottles or beer cans packed in their suitcases or carry-on. Such liquids are confiscated when passing through pier security because the cruise lines can not be sure such liquids are actually water, liquor or beer. They could be dangerous fluids. However, every passenger may board Royal Caribbean or Celebrity ships with a single bottle of unopened wine packed in his/her carry on. Guests may not bring on board ship multiple bottles of wine; only one bottle of wine is permitted per person. That single bottle of wine may be enjoyed in your stateroom. If you bring it into the formal dining room to be served during dinner you must pay a $15 corkage fee. When buying any type of liquor on shore (including wine) you must check (leave) such bottles with the ship's crew when returning to the ship. Your liquor purchases are returned to you at the end of the cruise. 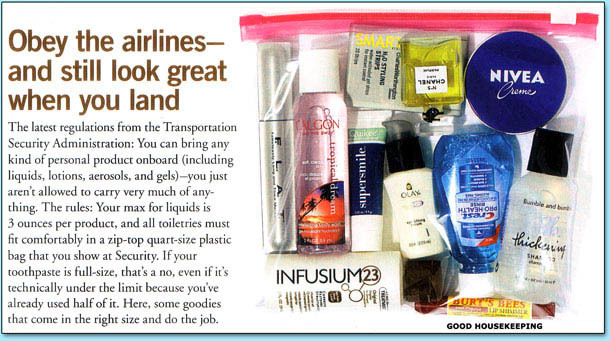 Remember that you may not take any liquid weighing more than 3 oz's onto an airplane in your carry-on when flying home. Do not let U.S. Customs take your recently purchased bottles of liquor away from you at the airport. Pack your newly purchased unopened bottles of liquor in your checked luggage when flying home. Do not open up soda cans, water bottles, or anything else found in your cruise stateroom or mini bar, unless you agree to pay for it. One bottle of water could cost $4. Each ship sells a selection of water, soda or wine packages for your cruise. You can even pre-pay for them by calling Celebrity at 800-722-5941 or Royal Caribbean at 800-398-9819. You will need your booking ID to place an order. Call at 800-955-9942 to acquire your booking ID. However, we recommend to buy drinks individually on the ship. Buying alcohol packages today is cost prohibitive. We recommend making all purchases for your cruise (including shore excursions) only on board ship. By doing so you will have financial recourse if you change your mind or are dissatisfied with any service or product. The Internet does not give you any refund, nor does it allow changes, but the ship's Guest Relations Desk will do both. Specialty coffee bars on any ship also sell for an extra cost. Be careful when ordering any specialty drinks. And pay attention to each tab you sign anywhere too. Every drink ticket already has an 18% gratuity added to it. Each tab that needs to be signed will ask if you want to TIP. By signing it you agree to pay a second 18% tip! Pay close attention to what you are signing. Tea, lemonade, juices, the ship's coffee and milk are always free throughout the ship during the entire cruise. 3.) How do I pay gratuities? May I use my debit card on the ship? To board ship you must give Royal Caribbean and Celebrity (your) credit card number. You are then issued another cruise card which also looks like a credit card. And you are automatically charged every day for all your tips to pay the attendants and waiters who take care of you. The charge is $14.50 (fourteen dollars and 50 cents) per day per guest, regardless of your age and regardless of how many of you are in a cabin together. Every passenger is charged $14.50 per day for the tips whether you're in an Inside, an Ocean View or a Balcony Stateroom. Passengers is Junior Suites or higher pay more in tips per day per guest. It is better to travel with a credit card and not a debit card because as Bank of America explains, "If fraud is committed on a credit card the bank will protect its card. But if fraud happens to your personal debit card the bank will not protect your card. Simply put, the bank protects its credit card account with you, but does not protect your personal money in the bank." It is best to travel with a valid credit card or with cash. There is a safe in every stateroom to hold your cash and other valuables. You are welcome to pay additional cash tips to your attendants at the end of the cruise. Sometimes cruise attendants lay out envelopes on your bed the last night at sea in case you wanted to leave more tips. You can write on the envelopes that you've already pre-paid the tips. Or, you could put in extra cash. Many guests leave behind the foreign currency they picked up on the cruise since they cannot use the foreign money when they return stateside. It is also customary to give a $1 cash tip to an attendant or waiter who delivers any item to your cabin during the cruise, such as food or drinks or laundry. If you order Room Service there is an automatic $8 delivery fee charged to your cabin. It is not $8 per food order, it is only one $8 delivery fee per cabin. There is no need to tip waiters on the ship who serve you alcoholic or specialty drinks because an 18% gratuity is automatically added to your tab when you're served any specialty drink. Only coffee, tea, milk, juices and tap water are free on the ship. 4.) How do I pay my own expenses on the ship? Before boarding ship you will be asked for a credit card or to deposit a minimum $500 cash. You are then issued a cruise card that looks like a credit card. All your purchases on the ship are charged to that card. There is no cash paid on a ship, other than paying $1 cash tips for room service. Charges you make on the ship are made to your cruise card, or drawn from your $500 cash deposit. Guest Relations notifies you during the cruise when your cash deposit is running low and/or when your card has reached its limit. Royal Caribbean and Celebrity will announce your name over a loud speaker throughout the ship asking you to come to Guest Relations if your account is overdrawn. Be prepared with a back-up plan to replenish your money sources, if needed. You can no longer obtain cash in the ship's casino. In fact, there are no cash advances permitted on board any Royal Caribbean or Celebrity ships in casinos or at Guest Relations using either credit or debit cards. The only way to obtain cash on board ship is to use an ATM machine, which is usually out of money because other guests deplete it quickly. Ditto for banks on shore. They often are depleted of U.S. dollars too because passengers from earlier cruise ships tap them out. Crew members do not service ATM machines. In fact, no one on board ship can assist you when an ATM is down. They are serviced only by contractors when the ship is docked. Plus, if any cash drawn out of an ATM machine on a ship it will have at least a 6% service fee. Do not count on ATM machines on any ship or on shore to provide you with cash. They are not reliable. The best way to travel is to carry cash in small bills. We recommend bringing at least fifty (50) $1 bills to make exact change. No foreign taxi drivers, tour guides or crew members can make change. Carry your own $1 bills to pay exact tips and small expenses. Do not tip with large bills because your change given back will be large amounts of foreign currency. And do not to use debit cards when you travel. Bank of America officials say a bank protects your credit card from fraud because the bank actually owns that card. A bank does not protect your personal debit card from fraud because only you have control over your cash in the bank. Be sure. Be safe. Be smart. 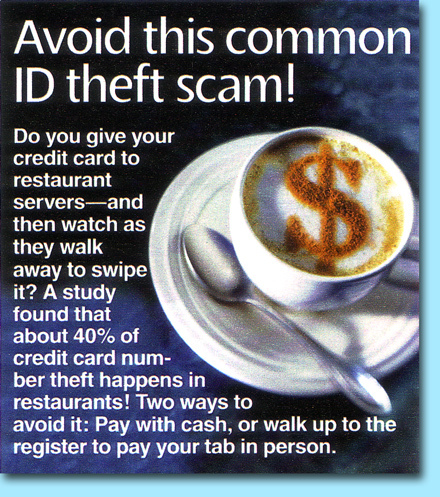 Do not expose your unprotected debit card. Travel with a credit card in your name. Gift credit cards are not accepted to board ship. Cash them before you arrive to the ship. On the last morning of the cruise an itemized statement of all your cruise charges will appear in your cabin. Any questionable charges must be settled at the Guest Relations Desk before leaving the ship. No charges can be contested after you exit the ship. From time to time during the cruise go to Guest Relations and ask for a print out of your entire cruise account. Review it carefully a day or so before you disembark. Be sure each charge is correct. If you find a mistake obtain a receipt from Guest Relations for any refund or credit you are due. Always get a receipt for EVERY transaction you make on any ship. You will need it for documentation if you return home and find incorrect charges on your credit card. You can not get back any monies from the ship. The best you can hope for is to convince your credit card company to stop payment. But you must have receipt(s) to back up your claim. Do not leave Guest Relations without written proof on letterhead that you have credit forthcoming, if you do. Without such written proof of credit it is very doubtful you will ever see it. Formal Night is a cruise highlight. 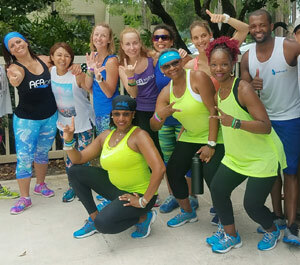 Hosts (LtoR) Caryn Martin, Jeannie Johnson, Sam Fadullon and Melissa Huffman, all of the D.C. metro area, enjoy hosting hometown guests on fitness cruises with formality. 5.) What do I wear? Club members dress fashionably when they take a cruise. Favorite seasonal outfits are fine. On any ship there are no changing rooms near the swimming pools. 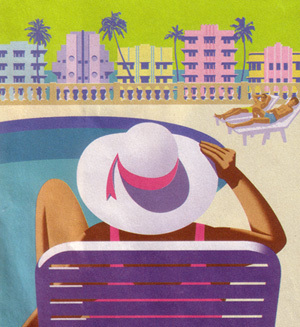 Guests usually wear shorts or robes over their swim suits when walking to and from the pools. Guests dress nicely for dinner each evening. There are 2 formal nights on a 7 night cruise: the Captain’s Welcome Dinner the second night at sea and the Captain’s Farewell Dinner the next to last night at sea. Longer cruises have 3 formal nights. Minimum formal attire for a lady is a cocktail outfit. Gentlemen are encouraged to wear a dark dressy suit with a tie. Men may not have open collars, or pull over shirts, or short pants in the formal dining room. Men who wear tuxes are a big hit on formal nights. 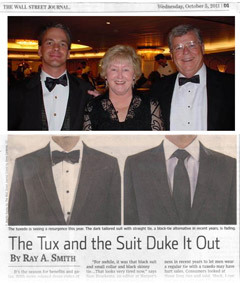 To rent a tux on the ship call 800-590-6193. Call at least two weeks before departure to assure availability. Cost is reasonable. There are no public laundries on Royal Caribbean or Celebrity ships. But room service does offer dry cleaning and ironing for a small fee. 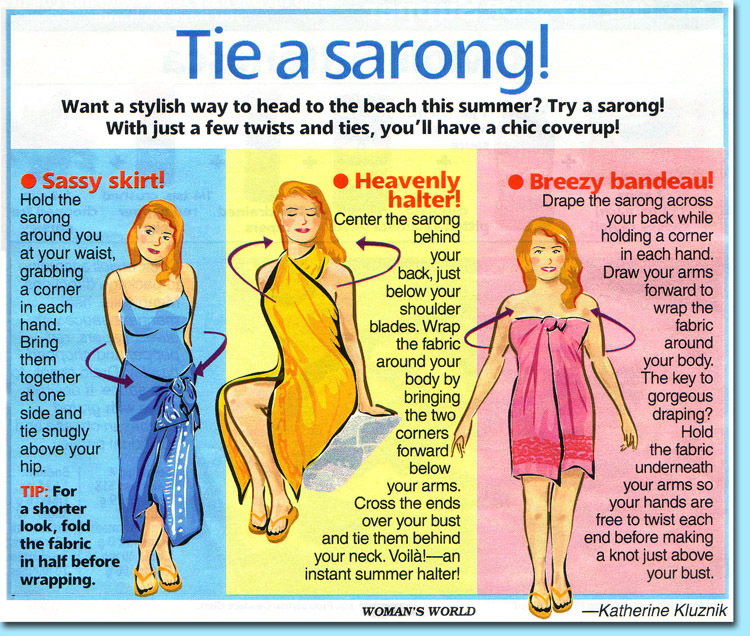 The list below can help you plan your cruise wardrobe. A guest may not dine in the formal dining room in jeans on any night. Shirts in the formal dining room must have stitched sleeves and collars, regardless of whether the meal is breakfast, lunch or dinner. Polo shirts are not proper attire in the formal dining room. Why must guests dress up? Guests who dress well behave well. This is important when thousands of people are traveling in a confined space and drinking alcohol together in the middle of an ocean. Officers and crew will be the best dressed and most courteous. members agree to follow all the requested dress codes of Royal Caribbean and Celebrity. 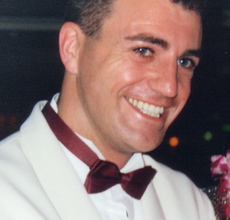 Shorter cruises to the Caribbean do not require elegant formal evening wear because the islands are very warm. On these occasions the minimum attire is country club cocktail for ladies and for gentlemen a dressy sports coat and tie. We request that all our guests dress nicely for every cruise event as a special courtesy to each other and to the cruise lines. 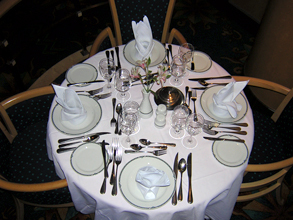 Persons who do not want to participate in formal dressing may dine in other eateries throughout the ship on the two formal nights. Casual attire in those eateries is fine. But again, when dining in the formal dining room be sure to dress formally for the evening. 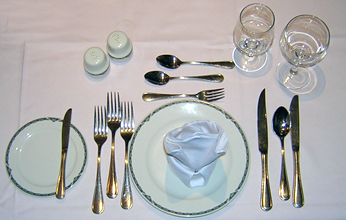 A notice in your cabin each morning advises what is the day's dress code for the formal dining hall that same evening. 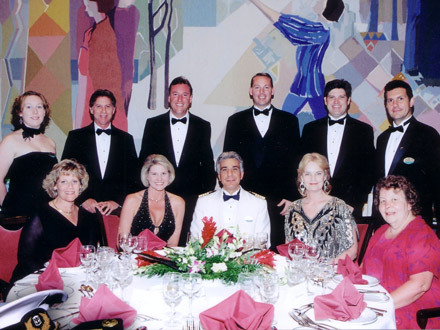 A HIGHLIGHT WHEN CRUISING is dining together on the formal nights at sea. Captain of Royal Caribbean's Legend of the Seas is Nikolaos Antalis. He invited the to dine with him in recognition of the their popularity at Royal Caribbean. Travel Coordinator Cynthia Neu McCluskey is seated (L) of the Captain; Fitness Host Coordinator Barb Batson is (L) of Cynthia. Standing behind Cynthia is Photographer Cliff Crittenden. Standing behind the Captain is Patrick McCluskey, creator of ExerciseFriends.com, a top 10 fitness site on the Internet, as reported by Amazon.com. Patrick is also Cynthia's son. One formal, one smart casual, all others casual. Two formal, two smart casual, all other casual nights. Two or three formal, two smart casual, all other casual. Three formal, four smart casual, all other casual nights. Casual: Sports shirts, slacks; sun dresses and pants. Smart Casual: Jackets, ties; dresses and pantsuits. Formal: Suits, ties, tuxes; cocktail attire, preferably dresses. 6.) Are there medical staff and facilities? Why do you require insurance? Yes. Excellent clinics, doctors and nurses are on every ship, but most are not licensed American medical staff. They are accredited from their own respective countries, but not usually the USA. Guests who have pre-existing conditions requiring specialized treatment will want to review carefully what medical care is and is not available on each ship. U.S. Medicare and Medicaid payments are not accepted for payment on any ship. Also American based health insurance companies rarely provide medical coverage on cruise ships. It is required for all guests to purchase AON travel insurance offered by Royal Caribbean and Celebrity when cruising with this travel club. Whenever medical care on a ship is administered to you the charge for it goes immediately to your Sea Pass account, which is, in effect, your credit card. Travel insurance sold by reimburses you for most cruise medical care costs up to $10,000 (ten thousand dollars), but only after you return home and file a claim. This insurance policy also protects guests from a price increase if at the last minute a roommate cancels for a qualifying reason. To read Royal Caribbean's newest insurance policy, click here. For a link to Celebrity's newest insurance policy, click here. Note: There is no charge for Dramamine. Nor usually is there a charge for speaking to a nurse. There is a charge for speaking to a doctor. If you're diabetic, have MS, sleep apnea, or carry oxygen when traveling, make it known when you book your cruise that you have special needs. In many of these cases prior clearance must be approved for you to board ship, especially if you are transporting oxygen or carrying needles. If you require a refrigerator in your cabin to keep medications cold be sure to book the category of cabin having this accessory, which is a balcony category or higher. Call 800-955-9942 at least 30 days before departure to report what special medical equipment or medications you want to carry onto the ship. Guests may not board ship until such items are cleared. Persons who are diabetic, have MS, or require daily shots must carry a doctor's note in their travel kit verifying their need to use needles. Travel insurance offered by Royal Caribbean and Celebrity covers trip cancellation, trip interruption and medical coverage up to $10,000, but does not cover pre-existing medical conditions. Nor does it provide coverage for elective surgery prior to a cruise departure. It is required for each guest who books a handicap cabin to fill out medical forms verifying the need for such a cabin, along with presenting a letter from his/her doctor requesting the special needs cabin. Paperwork to book a handicap cabin is sent to each guest when s/he initially books it. Always keep your hands washed, especially after using stair railings, pushing elevator buttons or opening cabin doors. Washed, clean hands contribute most to a healthy cruise. Be safe. Always wash your hands before eating. The diagram below shows the best way to wash your hands. It does not matter whether you use cold or hot water when you wash, but it is imperative to use soap to destroy bacteria. If you have any questions about liability or how much insurance protection there is regarding this club's insurance coverage call for clarification before you book. Insurance claims pay out less every year. For instance, any air fares or pre-cruise hotel rooms you book on your own are no longer insurable or refundable. We also want to mention that the U.S. Customs and Border Protection today enforces strict regulations upon travelers who want to bring back medicines into the USA from other countries. Before purchasing any medications abroad be sure they will pass inspection into the United States. Failure to declare such medications when re-entering the USA can result in penalties, confiscation, monetary fines and even arrest and prosecution. Be aware that some drug stores managers outside the United States selling pain killers to vacationing Americans might tip off U.S. government officials that you are returning home with a large supply of drugs known to be illegal in the USA. They do this because they are paid more to turn you in than what you paid them to buy the drugs. 7.) What about passports? guests must have a valid passport to travel with the club. This policy applies even when cruising only to Alaska, Hawaii, Mexico or Canada. Whenever a ship is 12 miles off shore from the continental United States it is in international waters. Therefore, a valid passport is required by the U.S. Immigration and Naturalization Service (INS) for anyone to re-enter the United States. The easiest way to obtain a valid American passport for travel, or to have it renewed, is to visit your local Post Office for assistance. When a passport is renewed it is assigned a new number. Anyone who travels with an INS Green Card must produce it too before boarding ship and again upon returning stateside. Anyone requiring a visa, or any other travel document, for international or domestic travel, has sole responsibility to obtain that visa or travel document for him/herself every time. is not responsible for either advising or obtaining visas for any club member. No one may board ship without being cleared by U.S. Homeland Security. Our club submits all required passport information to Homeland Security at least three months prior to departure. If you want to check whether you need a visa for your cruise click here: http://travel.state.gov/content/passports/en/country.html However, it is our travel club's policy not to cruise or travel anywhere where visas are needed or where one is required to have shots. We do not book such trips. Also, INS does not allow an American to cruise if s/he is facing a criminally charged court date, owes back child support, or has a tax lien. 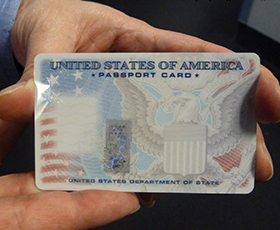 Ask your local post office how to obtain a new, or renewed, U.S. passport, if you need it. Passports must be approved by INS before cruise documents can be released by the cruise lines and/or are delivered to any club guests. Always travel with a valid Passport. National Passport Center toll-free number is 1-877-487-2778. Customer Service is open M-F 8 to 8 EST. A preparation fee is charged per passport. When returning to the United States at any port or airport it is common for INS to scrutinize each passport having less than six months validation. Why? Because such passports are often stolen abroad. A U.S. passport number is good only for 10 years. When a U.S. passport expires so does its number. Every new passport issued has a new number. Aliens can easily enter the United States illegally with a tampered American passport that's about to expire because once a Passport number expires INS no longer looks for it. Be sure to travel on a passport having more than 6 months validation. This precaution reduces the chance your passport will be stolen abroad. No one is exempt from being questioned by INS. The most innocent looking grandmothers are often questioned to prove the U.S. government is not profiling travelers. And when re-entering the USA always keep on you all receipts for any expensive jewelry you bought abroad. Customs is known to ask for receipts when Americans are reentering the country. Foreign jewelry stores often notify U.S. Customs which Americans are returning home with expensive jewelry. Store owners in the Caribbean and Europe, U.S. Customs and the cruise industry work together to prevent travelers from filing false insurance claims after they return home declaring their jewelry was stolen while they were cruising. Be safe. Be sure. Keep all the receipts you have on you when buying expensive gifts abroad on you. It also happens that persons selling medicines and drugs to cruisers will notify U.S. Customs and INS when certain passengers are returning with excessive amounts of medications, etc. The U.S. government pays informants in the Caribbean and in Europe more money for information about shopping Americans than Americans pay the stores to purchase drugs, legal or illegal. Don't be stupid. Don't buy any drugs aboard. It's not worth the crisis you face if caught. Avoid Passport Cards. Do not be tempted by your local post office to purchase a Passport Card instead of obtaining your real American Passport. Yes, you may board ship with a Passport Card and you may drive by car across the U.S. Border into Mexico, Canada and the Caribbean. But you can not you fly anywhere internationally using a Passport Card. If a real emergency happened at home while you were out of the country, if a family was in a car accident, or your house burned down, and for any other reason you needed to return home immediately, you would not be allowed to fly home from any foreign port of call using a Passport Card. 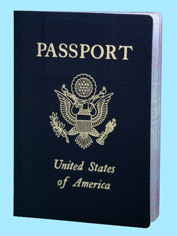 You must have your valid American Passport (blue booklet) to fly internationally. The Passport card costs about $100 while a real Passport (blue booklet) costs about $130. The card is good for 5 years. Your real Passport is good 10 years. Take the time, spend the money, be safe, be sure. Carry your valid American Passport. If there were to be another international crises in the United States like 9/11 and you needed to return home immediately only your American Passport would be accepted by any airline to fly you home to the United States. Forget the Passport Card. Its number starts with the letter 'C,' which travel agents call the 'Chump Card.' It is a glorified ID card. It is NOT accepted for International travel. 8.) How do we sign up for shore excursions? You can book shore excursions on the Internet in advance of your cruise utilizing the cruise lines' web site and by using your personal booking ID number to gain access. Call 1-800-955-9942 for your booking ID. Have a credit card ready to pay when you book on line. It is wise to preview shore excursions before arriving to the ship. Many shore excursions now have age and weight limits for every guest taking a shore excursion. We recommend booking shore excursions on the ship. More experienced cruisers often wait until the ship docks at a pier to take tours with local vendors. All prices are about the same. Guests should book exotic tours, like helicopter rides or fishing expeditions, on-line early because spaces for such tours are limited. Visit either ROYALCARIBBEAN.COM or CELEBRITYCRUISES.COM to book. However, it is better to book general shore excursions on the ship because if you change your mind, if the weather becomes foul, if you become sick, or if the excursion is canceled by the ship, you will be refunded all monies immediately that you'd paid for the tour. This is not true when booking on the Internet. It is impossible to get a refund for an excursion you booked on the Internet. The best you can hope for is that the money you paid for the canceled excursion is given back to you as on board credit (OBC). Once the Internet has your money it will not give you back any cash refund. You must have canceled a shore excursion at least five days before your cruise departs to qualify for any on-line refund. And who knows 5 days ahead of time that they'll have to miss an excursion? Shore excursions offered on board ship are managed by that ship. Excursions sold on the Internet are sold by independent vendors. The two entities compete for your business. They cannot access each other's records. Crew members on a ship cannot always help you with Internet bookings. They cannot easily change the times or dates for your excursions. They have limited access to Internet bookings. Also, do not charge your friends' excursions on your credit card on the Internet for them to pay you back later because if your friends do not go on that excursion it is futile to try to get any money refunded to your credit card. It is best to purchase all shore excursions on the ship, even though it takes longer. Your selection will be better too. Another easy way to enjoy shore excursions is for a group of at least 4 or 5 guests to rent a van and driver for the day on your own at the pier. Ask for an English speaking driver. There will be English speaking drivers wherever you dock. Your small group can tour faster and see more this way. But remember, if you take excursions on your own the trip insurance you bought with the cruise lines does not cover you if something goes wrong. To be safe travel in groups of at least four whenever you're off the ship. Stay together. Never go off alone. An excellent rule of safety is this: "Always stay on paved roads. Never go on a dirt road when walking or driving. " If you are computer savvy and prefer to book shore trips on the Internet go to ROYALCARIBBEAN.COM or CELEBRITYCRUISES.COM. Look for the section called BEFORE YOU BOARD. Then scroll down to SHORE & LAND EXCURSIONS. Keep moving through the process until it asks for your Booking ID number, ship and sailing date. Call 800-955-9942 for your booking ID. Shore trips are laid out by CALENDAR, PORT or EXCURSION. Not Royal Caribbean, not Celebrity, nor is allowed to book shore excursions for you. RCCL and Celebrity's shore side staff can explain over the phone how to book shore trips on the Internet. However, the cruise lines' staff members who can help you book over the phone are at Celebrity 1-800-722-5941...and Royal Caribbean 1-800-398-9819. 9.) What should I pack to wear? What about my pills? Stateroom closets are very small. 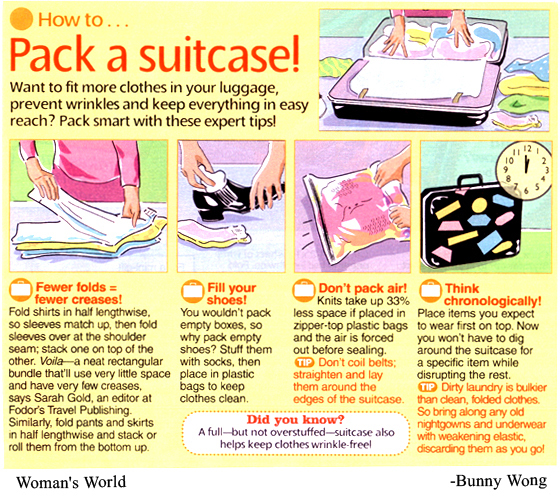 Store your carry-on inside your suitcase in your stateroom. Do not bring anything you personally cannot lift up and carry yourself. Rarely will there be anyone who can help you. In fact, most cruise ships now encourage guests to carry their own luggage off the ship, especially if they need to disembark quickly. This is not true when embarking (boarding). Luggage is taken from you at the pier when you arrive and delivered to your cabin. Always put the cruise luggage tags on before leaving home. Hotel and airport personnel know what they are. Luggage tags will arrive with your boarding documents. Luggage on rollers is best. Bell caps are expensive. Take your carry-on with a pool outfit, sweater, make-up, medications, sun glasses, sun screen, walking shoes, camera, jewelry, your valid passport and boarding ticket in it. And don't forget your hat! Wear your jacket in route to the ship to reduce weight in your suitcase. Pack two swim suits and two pairs of shoes. Keep your camera and spare batteries in your carry-on. Do not pack batteries inside checked luggage. And never bring an iron. Regardless of its size the cruise lines will seize any iron as soon as you arrive to the pier. Irons are a fire hazard. (Room service will iron what you need for a small fee.) When flying domestically your checked bag cannot weigh over 50 lbs. Your carry-on limit is 40 lbs. When flying over seas you may usually check two bags at 50 lbs each. A carry-on when flying over seas is still limited to 40 lbs. 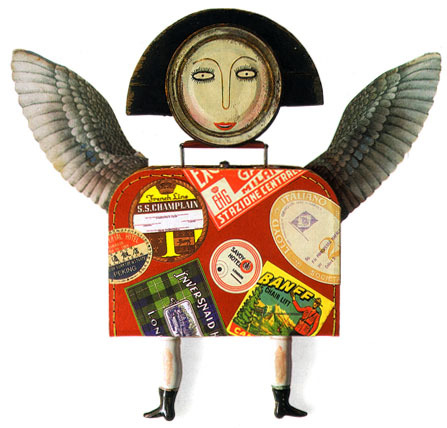 A woman may fly with a purse in addition to her carry-on. Any fluid container in her purse or carry-on is limited to 3 ounces. Men may bring satchels in addition to their briefcases on airplanes. But they too are limited to 3 ounce liquid containers. If you are bringing a large supply of pills or medicines you must have with you a doctor's prescription sheet or a pharmacy's order form verifying why you have all the medications. It is important for two reasons: 1) To be prepared to answer any U.S. Customs official or ship security inspector who asks, "Why all the pills?," or 2) God forbid, if you became critically ill during the trip and the treating doctor on the ship or ashore asked, "What medications are you taking?," you or your traveling companion could answer that question quickly and correctly. 10.) Is there long-term car parking at all piers? What about luggage? What time may we board? Yes. There is secured, long term parking at each pier. The parking fee is usually about $15 to $18 per day, or more. You pay the fee when arriving to any pier by cash or credit card. Shuttle buses drive through the lots taking guests and their luggage to the ship. If someone is dropping you off at the pier you may begin boarding only at 10:30 AM and when you return they can pick you up no sooner than 9 AM. People who live close to a pier disembark last because those who must catch flights home are taken off a ship first. When you arrive to the pier you are not allowed to carry your luggage up onto the ship. Crew members will take it and deliver it to your cabin after you clear security. Keep your carry-on bag with you because your luggage may not appear at your cabin until after dinner. Keep your medicines and passport with you at all time when boarding and disembarking. The first night’s dinner on any cruise ship is casual. What you have on when you board ship is fine for dinner, except that shorts, jeans and T-shirts are never allowed in the main dining room. Be prepared to dress for both cool and warm weather on any cruise day. Layers are best. Be prepared for rain too. Keep your hat handy. On the last night of your cruise you should leave your packed luggage outside your cabin door ready for the ship's crew to take it below ship by midnight. Colored tags will be given to you to tag your luggage. Colored tags allow you to easily identify your luggage on the pier in the morning when you dock. Or, if you must get off the ship very quickly when it docks then keep your luggage with you at all times to take off the ship yourself. To do this, however, you must pre-arrange your early disembarkation at the Guest Relations Desk while on the cruise. 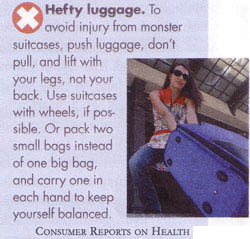 You cannot simply decide to keep your luggage with you to disembark. It must be pre-arranged to avoid intense morning confusion and/or investigation. 11.) What about flying? When booking flights: You may begin boarding ship at 10:30 AM on the morning your cruise departs. You cannot board earlier because the ship must first be cleaned up from the last cruise. Pick up your luggage at your airlines' carousel. Look for a cruise lines’ rep near the baggage claims area. S/he will direct you to a bus going to your ship. Show your pre-purchased bus transfer ticket. You can order it at 800-955-9942. Be sure all luggage tags show clearly to ensure delivery to your stateroom. If you and your cabin mate arrive to the pier simultaneously check-in together with the same crew person at the same counter to save you both valuable time. Otherwise, you may board separately. When your cruise ends the ship may not be able to dock early because of fog. Or maybe U.S. Customs is delayed. It usually takes two hours to disembark a cruise ship and two more hours to arrive to your airport and clear security there. For these reasons never book a flight home before 12 Noon. The rule is: Board ship starting only at 10:30 AM and fly home only after 12 Noon. This travel schedule is best. May I use Frequent Flyer miles to purchase air fare for my cruise? , Royal Caribbean and Celebrity do not accept 'Frequent Flyer' miles for air fares. However, guests are invited to contact airlines directly to use such benefits. In fact, air lines require passengers to apply to them directly when using any 'free' benefits. And effective Jan. 1, 2015, AON/Berkely Care no longer insures your air fare unless it's included in the whole cruise package sold to you by the cruise lines itself. 12.) Should I take my good jewelry? Do NOT ever pack jewelry in any checked bags you give to the airlines, hotel bell caps, or cruise lines' crew. Always keep your jewelry on your person, in your carry-on, or in your purse when you travel anywhere any time. If you'd be destroyed because you lost a piece of jewelry, do not bring it. When on the ship passengers wear lots of gold and nice jewelry, especially on formal nights. 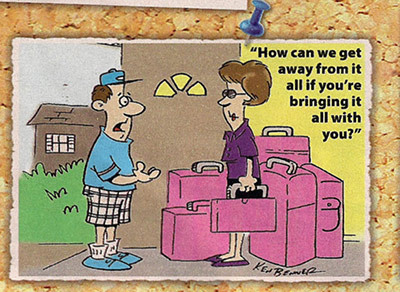 All cabins have a safe to store jewelry, money, passports, etc. You can take your favorite fine pieces to wear on the ship, but do not wear them in port. Don’t be afraid to over-dress during the cruise. Colorful costume jewelry is always fashionable. When you purchase expensive jewelry on a cruise ship or at a shop on shore keep it and its receipts on your person to declare when returning home the United States. U.S. Customs will often ask to see both the jewelry and your receipts proving you paid for it and have it. They do this because foreign jewelry stores work with the cruise lines and U.S. Customs to ensure tourists who bought expensive jewelry during their cruise do not return home to file false insurance claims declaring their expensive jewelry was stolen on the ship or in the foreign country. Be prepared to show them what they want to see, or U.S. Customs will make you unpack all your luggage right out on the pier. 13.) Is there gambling on the ship? Yes! Vera Pohedra of Annandale, VA won $4,000 on each of her two past cruises playing the slots. She says,"It pays to cruise!" And a recent Yale study found that casinos were healthy places because they require players to perform cognitive acts if they are to win, thereby delaying dementia. is pleased to sail on cruise ships with slot machines and gaming tables that include Roulette, Poker, Black Jack, Texas Hold’em and Craps. All are available every night when a ship sails to its next port of call. Guests may charge up to $2,000 per day for gaming chips. Casinos no longer allow guests to draw out cash on their Sea Passes, credit cards or debit cards. They must use on board ATM machines that charge a minimum 5% service fee if one pulls out cash. Guests may also cash one personal check for no more than $200 at Guest Relations one time only during the cruise, if they need cash to go on shore. Yes. Each day on your cruise ship will be many events. Often you can hear from expert speakers talking about your ports of call and/or giving “how-to” classes on such subjects as serving the best wines with certain menus. There are also many exciting sports events and champion Bingo games for big prize money. Club members have won many thousands of dollars in Bingo and at the casino when traveling with the . And don't forget about all the spa packages being offered. The ship even has a full state-of-art gym for workouts. At night there is dancing, stage shows and the always popular karaoke contests. Most fun of all is when club members win at karaoke. And they've won many times!! 15.) Why book a cruise so far in advance? 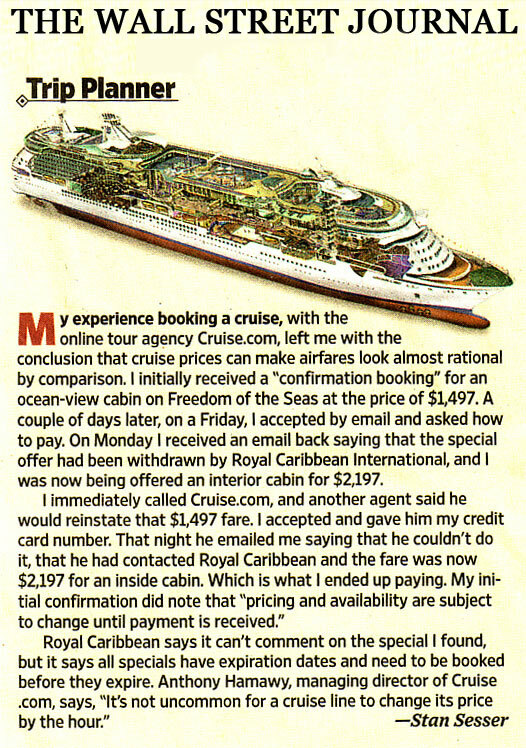 Booking a low cost cruise is like booking low cost air. 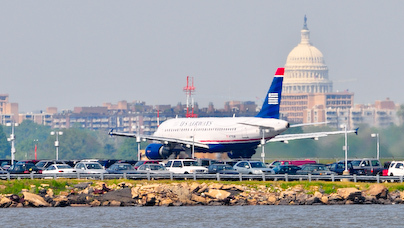 When an airline first announces its new flights it has low fares to promote sales. There are not many low air fares available for new flights, so it's important to book any low cost air early. It's the same when booking a cruise. The best staterooms/prices sell out first. While airlines announce new flights every 3 or 4 months the cruise lines open up new itineraries a year ahead of departure. Just as you want to reserve the best price/seat on an airplane, so too you will want to reserve the best price/stateroom on a cruise ship. Experienced cruisers with mid-ship staterooms near elevators book a year ahead of departure knowing if they cancel anytime up to 100 days before the cruise departs they will get a full refund. Airlines do not give refunds. does! When booking a cruise you can reserve the best cabin location at its lowest price. If you do not initially have a roommate still make a full deposit and add your roommate's name closer to departure. Because you booked early any roommate you invite will have your same low price. You can also change the name of your roommate within a week of departure without penalty, as long as you book early! 16. )Why can't I book on the Internet? Ask the invisible Internet the following questions: "Are port expenses included? Are international, federal, local and state taxes included? Is my stateroom mid-ship? Is it non-smoking? If a cabin category is not available when I initially book will you call later when one opens up? Does this price include travel insurance? Is travel insurance offered? Will you help me if I must file an insurance claim when I return? Is my deposit 100% refundable if I cancel? Will I receive a written confirmation within 48 hours verifying my stateroom number, deck location and sailing date? Can you help me with passport issues? Will a Travel Host be with me to assure my cruise expectations are fulfilled? Does this cruise have private exercise classes for me and my friends taught by certified fitness experts who I know and trust? Will someone provide me with packing tips, explain the ship's dress code and advise me of what customs I should observe in each country we visit? Will I have dinner each evening with my personal friends at our own private dining table? Do I have early security clearance? Early boarding? Early disembarkation? Do you offer fully escorted pre-and post cruise tours? Do you make hotel arrangements if I want to fly in a day or two early to our port of departure? What if I need flight arrangements? Can you help me with currency exchange questions and to obtain foreign currency? Will you book transfers for me to the pier and back to the airport? If I have a problem preparing for my cruise may I call you with my questions? Where exactly is your Internet office? What is your Internet phone number? Who is my Internet contact person? If I become sick on the ship will you be sure I get home safely? Will you obtain clearances for me to bring my CPAP machine on board ship and provide whatever medical assistance I may need for it to work? What if I need a handicap room, connecting staterooms or to change my cabin's location? If someone in my family needs me for an emergency at home will you notify me on board ship? Is your office located in the United States paying local taxes and employing American citizens? What if, at the last minute, my roommate can not go? Will you allow me to change names without a penalty? What if the cruise lines drops its prices? Will you voluntarily pass them through? answers "Yes," to all these questions. The Internet has no phone number for you to call. Our number is 800-955-9942. 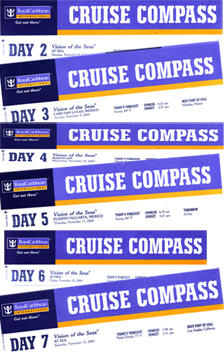 To participate in all programs and to receive all amenities, guests must book their cruises through . 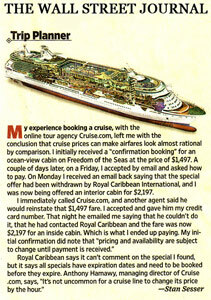 Click on the white box at right to read what the Wall Street Journal reported about Internet cruise "deals." There are no surprises when booking a cruise. Royal Caribbean Cruise Lines has again this year named its Number #1 Business Partner in the Mid-Atlantic states of Virginia, Maryland, Delaware and Washington, D.C.
members follow the more formal dress code of each ship when cruising. Better dressed guests behave better. That is why Royal Caribbean follows higher dress code standards. Male members of our travel club often dress in the formal attire suggested by the Wall Street Journal. A well made black suit with a silk black bow tie is fine for formal attire. A black bow tie dresses up any suit, writes Ray Smith in his WSJ report. It is perfectly acceptable to do this in lieu of wearing a tux, he reports. Cruise Fitness Hosts are AEA Certified. 17. )Where do we go for classes on the cruise? The first night at dinner on the cruise you're given a printed class schedule by your Fitness Host. It will specify where on the ship each class is being held, at what time and who is teaching. (Click on sample at left.) Fitness Hosts are certified in the exercise modalities they teach. They come from around the country as you see in this photo at the 31st International Aquatic Fitness Conference held in Florida in May of 2018. Triple Delight (in yellow Ts) received the 2018 Global Award for Aquatic Fitness Professionals. They are frequent hosts on cruises. Daily cruise exercises end by 9:30 AM allowing guests time to shower and have breakfast before disembarking for shore excursions. Disembarkation begins about one hour after the ship docks at each port of call. Club members who return from shore in early afternoons, or those who choose not to leave the ship at all, can enjoy additional exercise classes held mid-afternoons at various locations throughout the ship. Your cruise fare includes all exercise sessions. Everyone is welcome to take all classes. They're held in private only for club members who booked through the Classes are not open to other passengers on the ship. 18. )How can my family reach me in an emergency? Your family can call 800-955-9942 and ask Travel Coordinator Cynthia Neu for assistance. She will make contact with the ship. But Royal Caribbean and Celebrity insist it literally be a life or property threatening emergency before accepting the call. The quickest, easiest way to stay in contact with your family and friends while cruising is to use the ship's 24/7 Wi/Fi computer room services and/or use your cell phone whenever you're docked at a port of call. Cell phones work when you're docked. Roaming charges will apply. Cell phones cannot work while you're out to sea because there are no towers in the oceans to relay signals. The ships will offer Wi/Fi packages for sale. You can purchase them after boarding ship. But it is less expensive to use the public comupters provided at various public stations throughout the ship. 19.) How do I purchase a wine/beverage package before boarding? Click on this link. Review what you want to select. Then call Travel Coordinator Cynthia Neu at 800-955-9942 to place your order. Have your credit card ready to pay in full. It is a pre-paid order only. It is better, however, to order your drink/wine/beverage package after you board ship because on the ship you can change your order if there is a drink selection you like better. Whatever you order on-line prior to boarding the ship is pre-set and cannot be changed on the ship. It is two different vendors selling you pre-cruise drink packages and on board drink packages. The telephone number to call if you have questions about any drink package is 800-398-9819. There is no discount for booking drink packages before boarding ship. It's yet another reason to book everything on the ship. Travel irons are not permitted on the ship because they are a fire hazard. Room service can iron for you for a fee. Bring your own covered coffee mug, pen spot remover, bottle opener, sinus pills, aspirin, just in case you need it. Ships usually offer a Wake-Up Call Service, but bring your own travel clock to be absolutely sure. Do not bring extra hangers. Ship has plenty. Just ask for more. But do bring closet / hanger extensions. General stores on ship have sun tan lotions, toothpaste,brushes and most all known toiletries. members like to take attractive photos. Everyone has a better side of their face, either the left or right side. Stand in front of a mirror. Cover half your face. Then cover the other half of your face. How do they compare? Which ever side is your better side is the side you face toward the camera when someone takes your photo. This way you will always look wonderful! 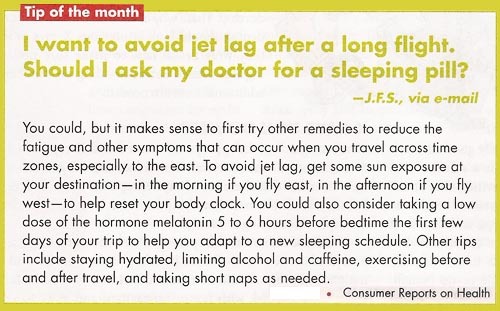 It's another favorite travel club tip! 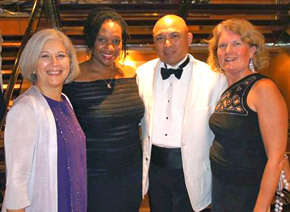 guests Dolly Banas and Nancy Wallace of Northern Virginia enjoyed taking a Panama Canal cruise. Their special cruise vacation that year also involved learning how to take excellent photos. Looking up into the sun is best, they found out. Everyone looks great in a photo when the sun is shining down on you and not from behind. Take 50 U.S. $1 bills for tips when traveling. Otherwise you return with foreign currency. It is customary to give the attendant delivering room service a $1 tip. It is the only cash tip you're permitted to give out on a ship during the cruise. It is very much appreciated when given. A safe is in your cabin. Steward can show you how to use it. Leave your passport in it. A computer filled, Internet access, room is open 24/7 on each ship. Use it. iPads can disappear. Bring more than one swim suit. Suits rarely dry out overnight in your cabin when at sea. Cabins have TV sets with constant weather reports showing conditions outside. There's one USA standard electric plug per cabin on dresser. Bring a small strip for more outlets. When traveling plan ahead for electric appliances. 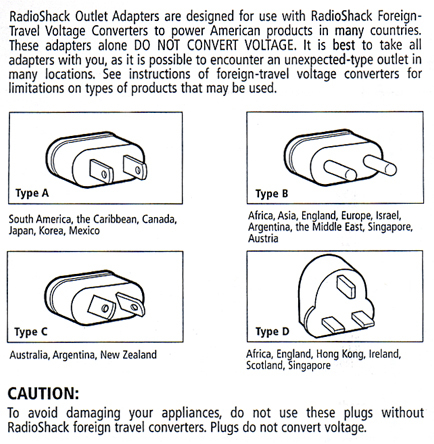 Bring both a converter and an adaptor. Cruise showers have shampoo/conditioner combo and no shower caps. Best to bring your own. Bring sticky notes to leave requests for steward since you rarely will be in cabin when s/he is. Bring your own hand mirror or table top mirror to apply makeup and see hair in back to style. There is wi-fi available at a cost of 65 cents per minute. It costs less when you buy a package. Check with your carrier to learn what cell phone service is available where you're going. Cell phones cannot work at sea because they are no towers to carry signals. "Roam" usually works when docked at any port. Wear a wide-brimmed hat that covers your face, neck and ears. 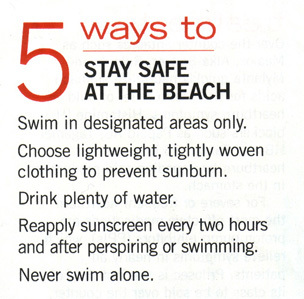 Use a broad-spectrum sunscreen with an SPF of 15 or higher on all exposed body parts, and reapply after swimming. Limit sun exposure between 10 AM and 4 PM when rays are most hazardous. If you forget a toothbrush, or another personal item, don't worry. Such items are available in any ship's general store. And stewards do their best to help you find whatever you need. But remember your cabin steward may not always be available. Be sure. Bring whatever you think you may need at any time. There is no limit to how much luggage you can bring onto a ship. The trick is to get it all past the air lines. And you must store all suitcases in your own Stateroom, which has limited space. Other than that, bring whatever you like. But remember you must be able to carry yourself whatever you bring because bell hops and agents to assist you are not always available. 21.) Do cell phones work? Check with your phone service before cruising, but usually cell phones work when you're docked in port. Roaming rates apply. And cell phones usually work in the public areas of a cruise ship too, when you are cruising. Cost to your cell phone will be at least $3 per minute. If you purchase an Internet package on board ship your cell phone likely will work in your stateroom too or in other enclosed areas when you're out to sea. The least expensive Wi-Fi package you can buy on any ship costs $40 for 24 hour access. Many guests report the most economical way to communicate with home when cruising is by texting. If your family has an emergency when you are cruising they can call our office at 800-955-9942 and we will notify the ship to have you call home. However, the ship will not accept any such call unless it is a true life or property threatening emergency which must be specified before we can make the call. Be sure your family knows your destination, ship and cabin number. If you have specific questions about your cell phone usage please call Royal Caribbean's Cruise Planner at 800-398-9819. 22.) Is Internet service available? Yes, ships do have Wi-Fi Internet packages you can buy costing from $40 to $200 per package depending upon how much time you want to purchase. However, do not rely upon the Internet on the ship for business purposes because weather conditions can impact satellite access. Sometimes a signal is not available because of poor satellite visibility. And it can break up constantly because the ship is always moving. As your Travel Coordinator, I recommend you think twice before bringing a lap top or iPad on your cruise vacation. There are too many ways it can be lost or stolen or forgotten. Do not bring any electronic item that would leave you devastated if you lost it. Too much is going on during your cruise to keep track of everything. There is Internet access at public computer stations located on nearly every deck. You can stay in touch with your home by using the ship's public computers while paying by the minute. This is better than bringing your own electronic gadgets to lose. Take it from someone who's heard many sad stories about lost lap tops. You will enjoy the cruise much more knowing yours is home safe. Once again, guests have told us the most economical way they found to stay in touch with their homes and offices was via texting. If you have specific questions about your iPhone, tablet, or iPad usage please call Royal Caribbean's Cruise Planner at 800-398-9819. Another helpful device is called 'goTenna.' It's a candy-bar size gadget that connects to your blue-tooth capable cell phone and lets you communicate wit`h your traveling companion as if you were on walkie talkies. It works where there's little or no reception. Cruisers can use them to communicate while wandering apart on a ship, or even on shore, when visiting ports of call. It helps guests stay in contact with each other by either text or voice. Check with your favorite camping company, like REI (Recreational Equipment, Inc.), for more information and to purchase it. You can also Google goTenna to find your nearest hometown distributor who sells this useful gadget. 23.) Who do I call if I forget something on the ship or have a credit card problem? The Lost and Found Department for both Royal Caribbean and Celebrity is open 8 AM to 6 PM every M-F and 9 AM to 6 PM on Saturday. Know your stateroom number, sail date and ship when you call 800-256-6649. Credit card issues can be discussed at this same number. If you want to participate in a post cruise survey click here to take the survey. For travel club members we welcome your comments at feedback@fun-fitness.com. If you return home to find an unexplained 'pending' charges on your personal credit card call this same number. Most 'pending' credit card charges drop off 72 afters after you return home from the cruise. 24.) Is smoking allowed on the ship? As of Jan. 1, 2014, cruise guests may no longer smoke in any stateroom on any Royal Caribbean or Celebrity ship. It is a fire hazard to smoke in any Stateroom, including sitting out on a Balcony. The only places where smoking is permitted? Top deck, near the Casino Bar, on the starboard side of the ship away from the outdoor pool, or in any Cigar Club when it is open. 25.) What safety precautions should I take when cruising? Practice the same safety precautions you do at home whenever you cruise. Be aware of your surroundings. If you feel uncomfortable at anytime move away from it quickly. Stay in areas on the ship and on shore that are well lighted. When on shore shop only in the downtown or open pubic markets. When you're on the ship shop only with crew in uniform. Follow directions. Read signs. Obey instructions from crew members. Avoid taking unmarked short cuts, narrow alleys or dark passages either on land or on the ship. Do not get into any unmarked taxi and do not drive on unpaved roads. Do not wander around the ship alone. Travel with a buddy on and off the ship. Be careful how much alcohol you drink. Have your cell phone fully charged and always with you. Do not open your stateroom door without knowing for sure who it is. Lock valuables in your stateroom safe, including your passport, jewelry and any cash. Take out only as needed. Do not take your valuables on shore. Your cruise ship Sea Pass card and your local driver's license will suffice as legal identification when you're on shore. Do not take your passport on shore! Cameras and purses should be carried out of sight and secured on your person with a strap whenever you go into port. Do not carry a purse just in your hands. Leave all electronic gadgets on the ship, preferably in your cabin's safe locked up. If you'd be devastated losing anything, do not bring it on the cruise. Most important of all.... Do not forget to smile and bring your valid passport. More than anything else, these two items will help assure you have a wonderful and safe cruise vacation. We thank you sincerely for taking your vacation with us. Your cruising pleasure will be ours. 26.) What are good questions to ask a potential cruise roommate? Guests sometimes do not have a cruise partner. No problem. Here's a list of questions to ask each other, if you're seeking a cruise roommate. In fact, these questions are good to ask even the travel partner you do know. Click here to view the roommate matching page. 28.) The ship is handicap accessible, but what about shore excursions? No Exotic CruiseTours are wheelchair accessible. Neither is Canada or Europe. Unfortunately, not we or Royal Caribbean is able to accommodate guests who are full-time wheelchair users in their travels. If guests who utilize a wheelchair full time can climb several steps to get into a motor coach by themselves, or one can move about in a regular hotel room (as opposed to wheelchair accessible rooms), we may be able to accommodate you. But we must be truthful and let you know that shore excursions routinely require extended periods of time to walk, usually over unknown surfaces and/or across uneven terrains. And there is extended times of standing with usually steep steps to climb. There are easy shore excursions, such as "local city tours," one can take without exiting the tour bus sponsored by Royal Caribbean, but first one must be able walk up into the bus. It is important to know other count ires of the world do not provide access for disabled citizens as does the United States. Please contact the Access Department of Royal Caribbean is you have more specific questions. That phone number is (866) 592-7225 or (954) 628-9708 any Monday through Friday, 9 AM to 7 PM Eastern Time. 29.) When we dock at ports of call what time do we follow? You follow the ship's time and the ship's time is whatever is the local time. Just as you follow local times to fly in and out of cities so do you use local time when cruising to and from different ports of call. 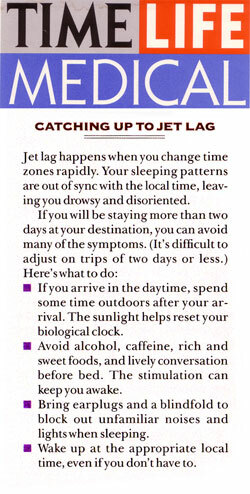 When you enter a new time zone it is announced throughout the ship what is the new local time. But be sure to ask for this information every morning because you may have unknowingly crossed into a new zone over night. When taking shore excursions booked through Royal Caribbean or Celebrity you have no time worries. Your guides will manage all schedules. But if you go out on your own be careful to set your watches to the ship's time so there is no problem later when your day ends at the port. Be back to the ship at least one hour before it is to depart. Often there's a line to embark. Don't be late! The ship will depart at its scheduled time with or without you on board. Atop the main Guest Relations Desk on each ship is a huge clock showing the ship's correct time. Be sure your personal watch always matches that clock and you will have no time problems when cruising.